113 volunteers help 28 Missouri residents clean up their flooded homes. 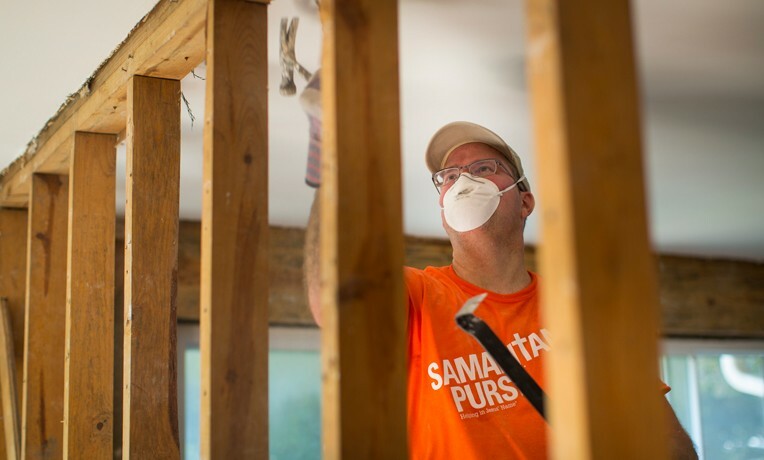 During the month of May Samaritan’s Purse disaster relief deployed 113 volunteers to help 28 homeowners clean up their homes in the wake of flooding April 29-30 in Doniphan, Missouri. Our deployment to the area began May 7 and concluded May 25. Working out of our base at host church His Place Fellowship in Doniphan, our volunteers spent 3,580 hours gutting flooded homes throughout the community. Homeowner Scott Smith and neighbor Jason Latham bond while working together to clean up Scott’s home from flood damage. Nearly every day since the flood, homeowner Scott Smith has read the passages in Matthew 6 about trusting in God’s provision. Scott’s neighbor, Jason Latham, became a living example of those verses. To demonstrate his recent recommitment to follow the Lord, Jason volunteered to help homeowners, which included Scott and his family. Serving as a disaster relief volunteer “makes me feel like I’m part of something again,” Jason said. Retired music minister Phillip Wiggs built his house so that the back porch would hang over the edge of Doniphan’s Current River. Normally a tranquil view, it was anything but tranquil after the flood. Phillip Wiggs couldn’t believe that water flooded both floors of his home, which he built in 1994. A couple of nearby homes were crumpled into a heap after they’d been washed off their foundations and carried by the river. Even homes in Phillip’s neighborhood that stood two stories high on stilts sustained water damage from the 30-foot flood surge. Phillip, 70, had suffered two strokes in the past year and couldn’t do any lifting to clean up from the flood. So he was grateful to see a youth volunteer team clear away water-warped wall- and floorboards. And it was also a blessing for team leader Patti Fryer. She said having the opportunity to work with the youth was inspirational. Wherever Samaritan’s Purse staff and volunteers respond to disasters, they serve in Jesus’ Name to meet spiritual as well as physical needs. Rapid Response Team chaplains from the Billy Graham Evangelistic Association accompany our teams to minister alongside them. Volunteers discard flood-damaged boards from Phillip Wiggs’ riverside home. While in Doniphan, chaplains led a man to faith in Jesus Christ in a “divine appointment” as they were driving from place to place, visiting homeowners in the community. Often the presence of volunteers and chaplains in a neighborhood draws neighbors’ interest and creates additional ministry opportunities. In Doniphan, a boy was curious about the activity occurring in his neighbors’ yards as volunteers removed flood-damaged items. The boy stopped by to visit the volunteers from time to time while they worked. They befriended the boy and explained their service in Jesus’ Name, which includes presenting a Bible to each homeowner they help. The boy asked the team if he, too, could receive a Bible. So the team was able to give him a children’s Bible. The boy was very excited to finally have a Bible of his own. Samaritan’s Purse disaster relief teams and BGEA chaplains also have been helping homeowners in Durant, Mississippi, since May 7 after the same series of storms spawned a tornado in the central part of the state. We plan to complete tornado clean-up efforts there by the end of June.